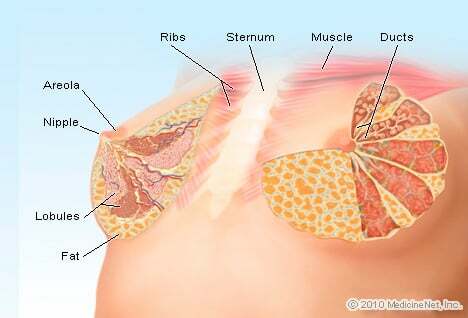 What happens after my breast cancer surgery? What are lymphedema symptoms and signs? How can I help prevent lymphedema? What can I do if I already have lymphedema? What is the prognosis for lymphedema? Excess fluid is collected from the space between tissues in the body and moves through the lymph vessels. The fluid (now called lymph) isn't pumped through the body like blood, but instead is "pushed" through the lymph system as the vessels are compressed by surrounding muscles. Filters called lymph nodes remove certain harmful substances from the lymph fluid, such as bacteria and debris. The fluid from most tissues or organs is filtered through one or more lymph nodes before draining into the bloodstream. Lymphedema is an abnormal buildup of fluid that causes swelling, most often in the arms or legs. The condition develops when lymph vessels or lymph nodes are missing, impaired, damaged, or removed. Secondary lymphedema occurs as a result of a blockage or interruption that alters the flow of lymph through the lymphatic system and can develop from an infection, cancer, surgery, scar tissue formation, trauma, deep vein thrombosis (a blood clot in a vein), radiation, or other cancer treatment. Lymphedema develops after breast surgery because there is an alteration in the pathway that drains the fluids involved in the immune system. It can occur at any time after the surgery. If untreated, it can become worse. Following surgery, a physician will examine you and take arm measurements. Sometimes, there may be redness or pain in the arm, which may be a sign of inflammation. Depending on your symptoms, your physician will then consider the best treatment options for you. If you suspect any of the symptoms of lymphedema listed below, call your health care provider right away. Prompt treatment can help get the condition under control. Swelling in the arms, hands, fingers, shoulders, chest, or legs. The swelling may occur for the first time after a traumatic event (such as bruises, cuts, sunburn, and sports injuries), after an infection in the part of the body that was treated for cancer, or after an airplane trip lasting more than three hours. A "full" or heavy sensation in the arms or legs. Lymphedema is diagnosed after a careful evaluation of your medical history, including past surgeries and treatments, an evaluation of current medications and symptoms, and a complete physical exam. Sometimes, additional tests may be needed. Lymphedema treatments vary, depending on the stage and cause of the illness. The most important aspect of treatment is learning how to care for your health. Your doctor or nurse will teach you and your family how to follow your prescribed treatment. If the initial signs and symptoms of swelling are caused by infection, antibiotics may be prescribed. Other treatments may include bandaging, proper skin care and diet, compression garments, exercises, and manual lymphatic drainage, a gentle form of skin stretching/massage. Lymphedema can be prevented or controlled if it develops by following the recommendations below. Reduce foods high in salt and fat. Include at least two to four servings of fruits and three to five servings of vegetables in your daily meal plan. Use the package label information to help you to make the best selections for a healthy lifestyle. Eat foods high in fiber such as whole-grain breads, cereals, pasta, rice, fresh fruits, and vegetables. Maintain your ideal body weight. A registered dietitian or your health care provider can help calculate your ideal body weight. To improve cardiovascular fitness, you should perform aerobic activities (including walking, swimming, low-impact aerobics or specially prescribed exercises) for 20 to 30 minutes at least three times a week. Take time to include a five-minute warm-up, including stretching exercises, before any aerobic activity and include a five to 10-minute cool down after the activity. If your normal exercise routine includes weight lifting with your arms, check with your doctor about the best time to resume this activity and if there are any weight restrictions. Frequently wash your hands with soap and warm water, especially before preparing food, and after using the bathroom or after touching soiled linens or clothes. Notify your doctor if you have redness, swelling, a skin rash or blistering on the side of your body where you had surgery, or if you have a temperature over 100 degrees F (38 degrees C). These warning signs of infection could be an early sign of lymphedema and should be treated immediately. Your doctor may refer you to an occupational therapist who specializes in managing lymphedema. The therapist will assess your condition and develop an individual treatment plan to manage your lymphedema. Continue to see your health-care provider for frequent follow-up visits, as recommended. What Is the Outlook for Lymphedema? Lymphedema cannot be cured. However, with proper care and treatment, the affected limb can be restored to a normal size and shape. In addition, lymphedema can be treated and controlled so that it does not progress further. If left untreated, lymphedema can lead to increased swelling and a hardening of the tissue, resulting in decreased function and mobility in the affected limb. It can also lead to chronic infections and other illnesses. It is important to receive treatment promptly if you recognize symptoms of lymphedema.